The Philippines SuperTrail race in Clark is once again the scene for a crucial battle in the Asia Trail Master Championship, albeit not the final battle for sure. In both the men's and women's race, ATM title pretenders are facing each other with the current points leaders absent. Both Arief Wismoyono and Tahira Najmunisaa Muhammad Zaid have decided to sit this one out and see what happens with Manolito Divina, Sefli Ahar, Pablo Diago Gonzales, Kim Matthews, Ruth Theresia and several others this weekend. CM50 Ultra is one the Philippines' classic races, and in case you wonder, it is 50 miles and not 50k. Both the male and female ATM championship is tight this year, and several runners still have a chance to become champion. Contrary to last year, home favourite Manolito Divina is under quite a bit of pressure. As a triple winner of this race, he has home advantage and is for sure the one-to-beat, but is he as fast as last year? In the past two months, Divina had to settle for two second places (Vietnam Mountain Marathon and Ultra Trail Mapawa) when he was expected to win. It cost him 100 points for the ATM championship, which has made him more vulnerable and has allowed other top runners to dream about the title themselves. On paper the fastest challenger for Tolitz tomorrow is Brunei's Sefli Ahar, unbeaten in 4 ATM races if we exclude the unfortunate DNF at Penang Eco this year. Recently, Ahar broke the 102k course record at BTS Ultra and if anyone can follow the sheer running speed of Divina it is him. Ahar himself wants to become ATM champion and quite simply must score a big result, as he only has 3 results in the books so far. Other contenders for at least a podium this weekend are Pablo Diago Gonzales - let's not forget he won 3 ATM races this year -, Kristian Joergensen, James Tellias and Rexell Aguirre. Especially if it were to rain, keep an eye out for the technically skilled Gonzales. The three leading women of the ATM championship are only 25 points apart in the ranking, and the numbers 2 and 3 are ready to jump ahead of Tahira Najmunisaa this weekend. Both Kim Matthews and Ruth Theresia have taken the battle to Tahira all season, at least in terms of points. The Australian and the Indonesian will be running together for the first time at CM50, and it is anyone's guess who will come out on top. Both are multiple race winners this season. 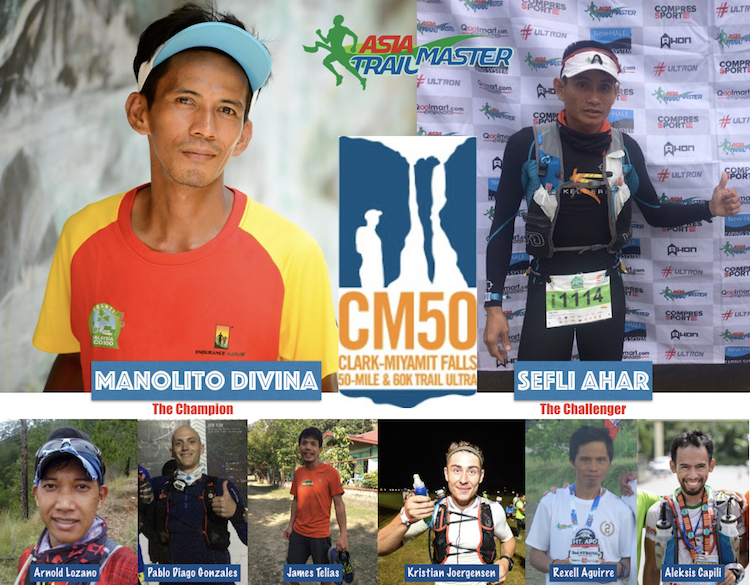 CM50 being a SuperTrail, the winner will collect 550 points and that is enough to jump marginally ahead of the Malaysian 2016 champion, whose future in ultra is the subject of much debate these days, in fact. Local runners who can be expected to fight for the podium are Maria Luisa Prado and Diorella de la Cruz Cerujano. As usual, we will be reporting live from the action at CM50 Ultra throughout the night and day via our social media channels. Can Philippines-based Kristian Joergensen cause an upset this weekend?